I’ve been thinking a lot about passata di pomodoro lately. As it turns out, the Principe Borghese are particularly well suited for making this. For a home cook, this simple, unadorned puree of tomatoes is like having money in the bank. I don’t rest easy until I have a full shelf put up and stored for the season, knowing it’ll serve as a base for many meals to come. 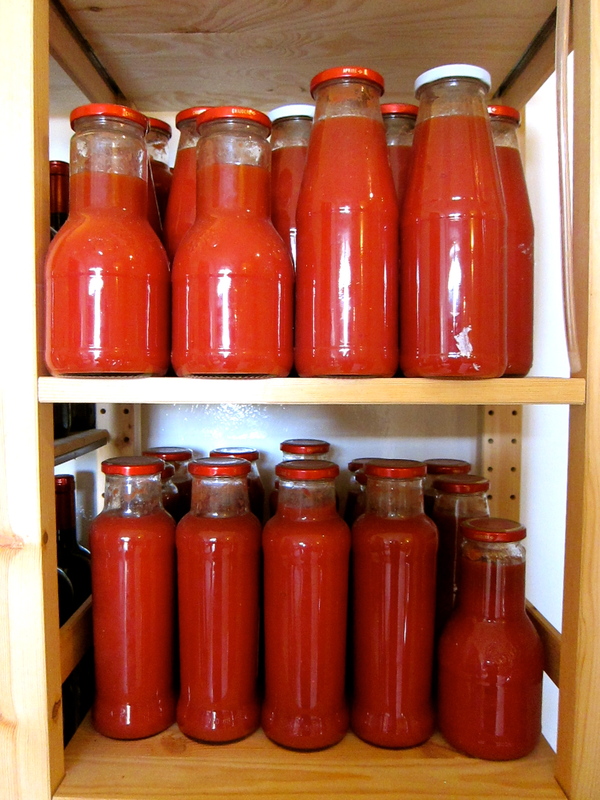 Passata di pomodoro at Masseria Aprile. Though things are winding down, there was still enough eggplant and basil in the garden to make the Sicilian dish, Pasta alla Norma — a last bit of summer before we head into the new season. Though eggplant is the main ingredient, some say the success of Pasta alla Norma depends on the sauce. Since the Sicilians always put sugar in their tomato sauce, I do the same here. It won’t taste right unless you do. The same for the ricotta salata—you can make a substitute, it just won’t be Pasta alla Norma. – Trim the stem off the eggplants, and cut them (skin on) into 1/4 inch slices or 1/2 inch chunks. Pat dry, and fry in hot olive oil until browned, about 10 minutes. If necessary, cook the eggplant in batches to avoid overcrowding the pan. Eggplant should be soft and cooked through, with some color, but not falling apart. Remove and drain eggplant on paper towels. – Wipe out the pan and add the tomato sauce. Season the tomato sauce with a pinch of red pepper flakes, and bring to a low simmer to keep warm. – Cook the pasta until al dente, drain and add to tomato sauce. Off heat, toss with 1 cup of the ricotta salata and the basil, then the eggplant. Season with salt and black pepper, and finish with some good Sicilian olive oil. Serve at table with the rest of the ricotta salata alongside. – Saute the onion and garlic in olive oil until soft. Add the tomato puree, basil, sugar and some salt, and simmer 20–30 minutes. This isn’t meant to be a long-cooked tomato sauce, the shorter cooking time makes for a brighter flavor. – Remove the basil. Pass the rest of the tomato sauce through a food mill for a smoother texture. Note: With such a short growing season here in Southern Maine, we’ve had more success growing the smaller varieties of eggplant. We’ve been growing 2 kinds — Fairy Tale and Orient Express, both hybrids with shorter days to maturity. Some heirloom varieties that we’re considering for next year are the Listada di Gandia and the Violetta Lunga. Recipe adapted from “Cucina Siciliana” by Clarissa Hyman. 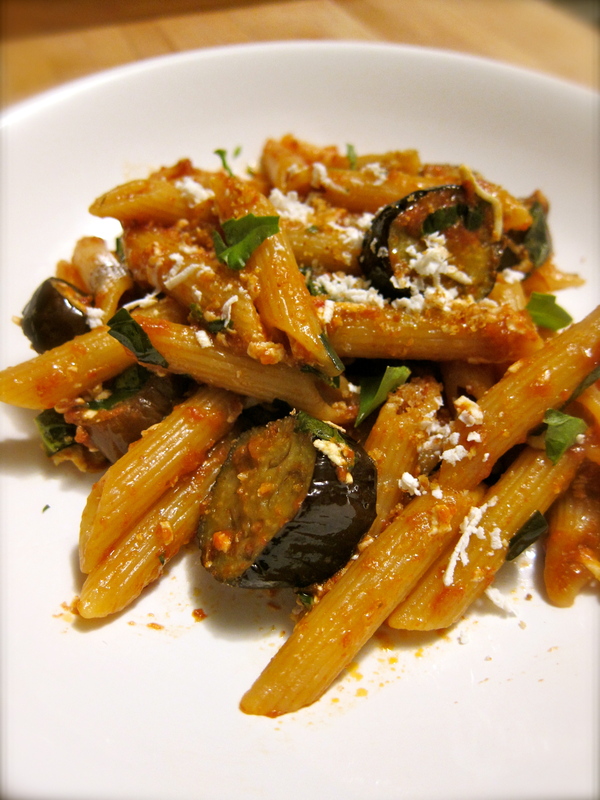 This entry was posted in cooking and tagged eggplant, pasta, tomatoes. Bookmark the permalink. That’s quite the dish you have there, and simple (it seems) to put together. I think my last eggplant my try to emulate yours. I’m curious about your lids. You canned that sauce of yours? What sort of lids and jars are those? Hi Randy — having the sauce on hand makes it even simpler! This is the dish everyone grows up with in Sicily, so there are many variations particular to each family but the basic ingredients remain the same. If you have large eggplants, you can cube them; the dish done this way goes by another, less savory name. There’s another variation where you layer the ingredients along with hard-cooked eggs, and bake. In any case, having eggplants straight from the garden means never having to salt them!